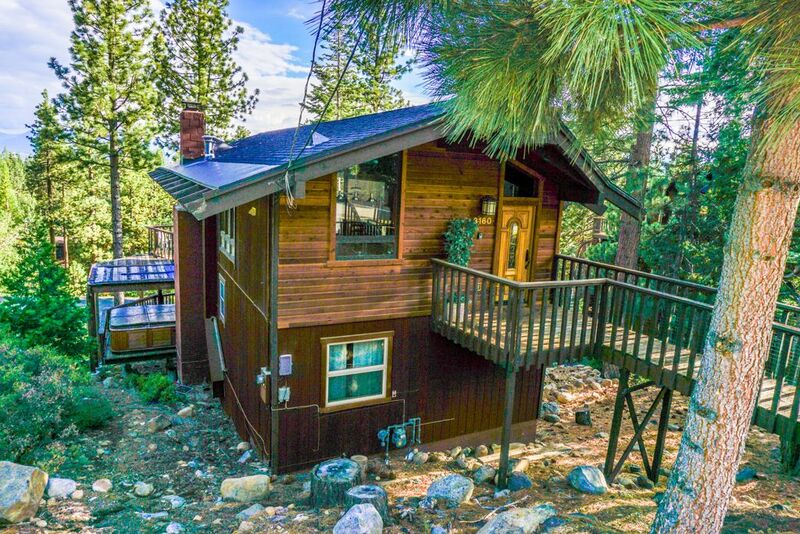 The Buck Haus is a dog-friendly North Lake Tahoe vacation rental with a peak lake view, great view of the mountains, a hot tub, and a great central location. Less than 2 miles from Tahoe City on Lake Tahoe's beautiful North Shore, this vacation home offers a spacious multi-level layout allowing for gatherings of large groups or multiple families. The Buck Haus offers easy access to the Tahoe City bike path as well as a short drive to both downhill and cross-country skiing at world renown Lake Tahoe ski resorts such as Squaw Valley and Alpine Meadows. As you enter this home, you'll get an immediate view of the mountains and lake. The split-level, open-plan design means that from the kitchen, dining room, living areas and large deck you can see beautiful mountain and a peak of the lake. The kitchen is large and well equipped with lots of preparation room and is open to the dining and living areas, so you can keep an eye on the children playing or chat with the people in the dining room. After dinner, you can enjoy an open fire in the large stone fireplace in the living room - perfect for those cold evenings. Down the stairs are 2 bedrooms, each with a king bed with new linens and down comforters. These bedrooms share a bathroom. Down the next level, there is another bathroom, the laundry facilities, and 2 more bedrooms one with a double and a twin bed and the other with a queen & a twin bed also with new comforters and linens. Each of these lower bedrooms opens out on to another large deck with a hot tub. The Buck Haus sleeps 10 people comfortably. The living areas have beautiful high cathedral ceilings and a wall of windows looking out on the trees, mountains and the lake, and fills the home with lots of natural light. For relaxing at home, the house is equipped with TV/VCR with cable & stereo with CD player. Off the living area is a large sunny deck with patio furniture, a BBQ and a hot tub for making this outdoor area great for summertime entertaining. The location is great for summer or winter vacations, including a great dog beach just around the corner. In summer you can also go rafting down the Truckee River, water ski or swim in the lake, rent a jetski or enjoy the many hiking and biking trails around the lake. Within a 10-mile radius, there is a multitude of scenic and challenging golf courses, or you can relax and enjoy yourself at one of the many lakefront restaurants. In winter you are a surrounded by some of the best skiing around, with World-renowned resorts like Squaw Valley, a 15-minute drive from the house. There are also beautiful cross country and snowshoe trails with views of the lake, and snowmobile tours for those who want some variety. At night, there are so many great restaurants and bars you'll have difficulty deciding where to go next! This is a dog-friendly house but in order to bring a dog, you must pay a $70 dog fee per dog, 2 dog maximum. If you bring a dog without paying the dog fee, you will be subject to a fine and are in breach of contract which could result in being asked to leave the property. Nice property close to everything. Enjoyed our time in Tahoe. Kitchen is well stocked and the living room is great for hanging out. Great location. Great location, lots of space! We loved the Buck Haus cabin! It was perfect for our low-key bachelorette weekend. Kitchen was well stocked and the grill was perfect for dinner in, the deck was great and we loved the large windows and huge doors in the back that allowed for all the sunlight and fresh air to enter the house. Amenities, supplies, beds, bedding, towels and dog bin were all excellently provided for. The place was extremely well kept, clean and comfortable. The location is superb. I would definitely stay here again. I would never rent this house again. Upon arrival the house cleaners were still cleaning. Paper supplies such as toilet paper, paper napkins, bath soap non existent, towels were minimal and only two wash cloths. Several of the light fixtures did not work or had light bulbs burned out. During the day the living room was extremely hot. No ventilation. The ceiling fan was of little use to cool the room down. One of the outdoor black rod iron chairs was broken and someone almost fell over backwards. Small flatscreen TV in the living room. Old DVD player - could not read our DVD's. Two bedrooms on the bottom level were small & cramped. The owners added a twin bed to each room which blocked access to the closets. The hottub, located next to the downstair bedrooms was on 24/7. It made a high pitched humming noise, then would gurgle about every 45 minutes. so much for peace and quiet. One of my guests was a structural engineer. He looked at the upper deck and said it was unstable and could easily collapse. Get rid of the dead animal head in the living room. As environmentalist it was very depressing. I have vacation rental property, so I am aware of how a vacation house should be stocked and ready for guests. The rental managers did send Dirk over to fix the lights and bring supplies. The Buck Haus is a dog friendly North Lake Tahoe vacation rental with a Lakeview, new hot tub and a great central location. Less than 2 miles from Tahoe City on Lake Tahoe's beautiful North Shore, this vacation home offers a spacious multi-level layout allowing for gatherings of large groups or multiple families. Thank you for the review Alenka.